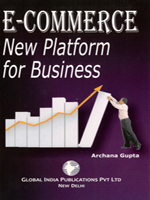 This book has been specially prepared to acquaint the newcomer to the world of business, and also those following traditional methods, to learn what E-commerce is all about. It provides the readers with not only a basic understanding of the subject but also trains him to use it properly and for profit and gain. The technology of the internet has been explained in easy-to-understand terms. In fact, the entire book has been written to ensure that the learner does not get bogged down in technical details but gains a crystal clear concept of E-commerce and its business applications.